Take some time to read on your walk! Enjoy our Burlington Story Trail. The pages of the picture book "Scoot!" by Cathryn Falwell are reproduced on signs along the Port of Skagit Nature Trail, and children and their caregivers can read the story as they walk. Turn west off of the I - 5 Hwy 20 exit 230. Drive 4.4 miles to Higgins Airport Way. Turn North on Higgins .5 miles to Ovenell Road intersection. Watch for the Port of Skagit Nature Trail parking lot. 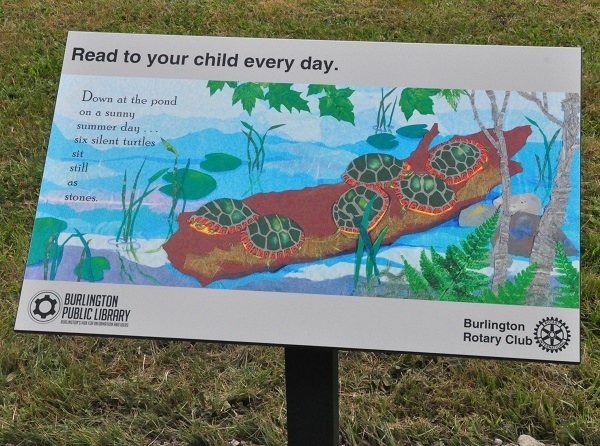 The Burlington Story Trail is a joint project of the Burlington Library Foundation, the Burlington Rotary Club, and Port of Skagit.